Consumers have known for years that tomatoes from the grocer often taste bland, have bad texture, and can be as hard as baseballs. But UC Davis biochemist Ann Powell has come up with the answer — it’s a disabled GLK2 gene. That’s essentially why that perfectly-shaped and bright red tomato found in supermarkets has no taste. Simply stated, the clinical removal of the GLK2 gene resulted in the diminishing of tomatoes’ sugar content. The gene controls the development of chloroplasts, structures in the plant enabling it to photosynthesize and create sugars. That affects both the taste and color of the fruit, said researchers. 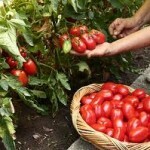 Originally, tomato breeders thought the alteration increased nutritional value, also. There is no “Scientific Tinkering”. This variety was created by classical methods of breeding that were around prior to Gregory Mendel or Charles Darwin. Therefore the comment “Simply stated, the clinical removal (of the gene)” is also an incorrect statement. There was no “Clinic”, and no Clinical removal (not that modern Gene alteration is accurately describable in these terms). CCN Staff; Words have meaning. Grab a few just to make an article your own, and the story changes into something else. The San Jose Mercury article clearly identifies the tomatoes as an outcome of old fashioned breading techniques. What Mendel did was very scientific. Genetic Engineering is so crude that it’s giving science a bad name. Oy Mr. R., where to start? Both Darwin observing Natural Selection, which required him to also research animal breeding, and Mendel who propagated and recorded crosses of genes that were unlinked, used exemplary scientific method. Which is why I noted that the Tomato breeding “technology” predates them and any scientific method. I avoided expressing an opinion as to “Genetic Engineering” and avoided using that phrase directly choosing “Genetic Alteration” instead. Those are “loaded words”. I get you and others have a strong opinion, as you express. As far as I am concerned it a technology. You can use a lathe to make a wheelchair or a rifle. Same thing. I respect your opinions to the contrary, but was trying not to have that discussion given that this is a report about why flavor savors taste like cardboard while clearly erroneously identifying “Genetic engineering” as the cause. Odds are since the technology exists the “Semi Wild State” of the non functioning gene will be restored by “genetic engineering” rather than by breeding. You or I will not be able to distinguish between the two. Then we will have a sweet tasting cardboard tomato. Frankly I think the lack of chloroplasts (original article talks of a cross linked trait) is what keeps the fruit from spoiling, so once the gene is restored the shelf life will shorten. You have some experience in communicating complex ideas in a much reduced form and to a large audience. My comment was about CCNs failure to convey the meaning in the original and longer article, which had nothing to do with genetic engineering as such but has to do with the current attempts (using a similar molecular biology tool-kit) to describe the genomes of many plants and animals made possible by recent advances in sequencing technology. This is a part that could make both Darwin and Mendel proud. As for you and me “You call it tomatoe and I call it tometo, let’s call the whole thing off”. P.S. Thank you for overlooking my error “…tomatoes as an outcome of old fashioned breading techniques” that would of course, apply only to breaded fried green tomatoes. Ah, leave it up to the true scientist doing science! Semantics wins again and tomatoes turn into little red rocks that we throw at each other.Woe to us in the Pacific North West forced to eat a pale tasteless copy of the original topped with vitamin D because we get no sunshine. Good tomatoes are like wild horses, there aint no such thing. Thank you for the detailed exposition! Killer tomatoes…Killer ToMatoes ! …KILLER TOMATOES ! Their resistant to shipping damage but tasteless product has saved me from spending hundreds of $’s on their creation.